This week, it's time to get back to Venice. Specifically, the sestiere of Dorsodouro (or Dorsoduro in some circles). Don't remember what a sestiere is? 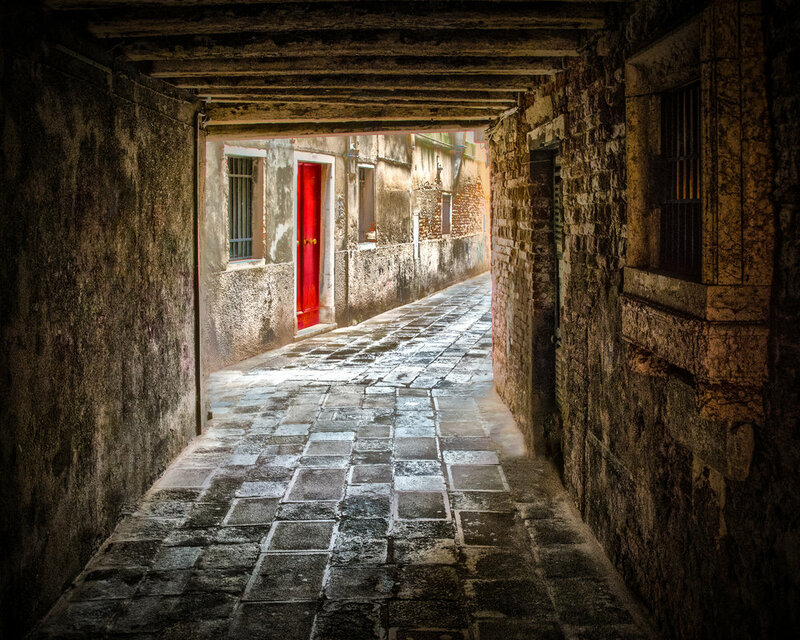 Please, review my previous article of January 3, 2017, titled "Venice's Sestiere". We like Dorsodouro for its quiet charm. And there is variety in that you have both large and small campi, small canals, and then the walkway along the large, sea-like Giudecca Canal. This map shows you Dorsodouro's location within Venice...it's the lime-green-shaded area of the map. And in this birds-eye view, you can see detail of the boundary of the Dorsodouro sestiere. In the aerial view above, draw an imaginary vertical line down the center of Dorsodouro just to the left of Campo Santa Margherita. Then, focus your time to the right of that line...most all you would want to see in the sestiere of Dorsodouro is in the eastern limits. Perhaps the most prominent feature of Dorsodouro is the church of Santa Maria della Salute. 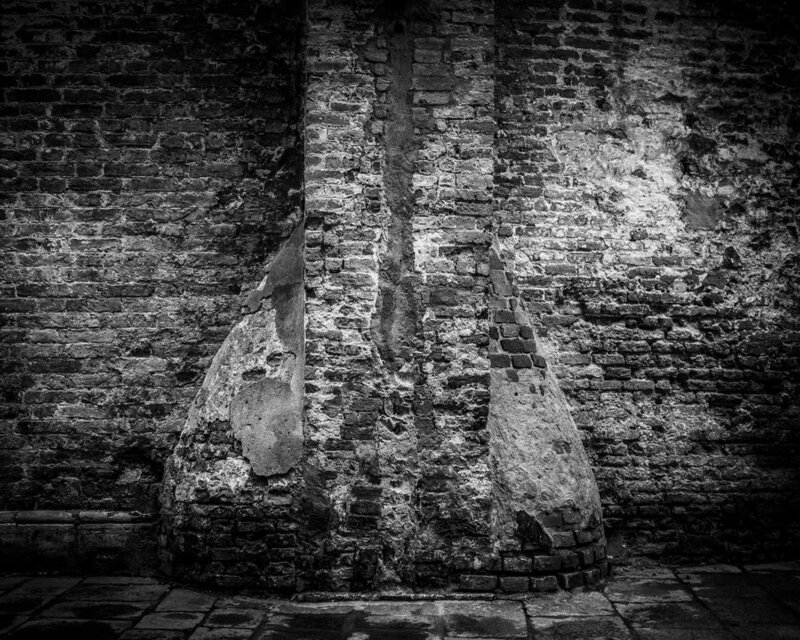 You've seen it before in my article of titled, "Transforming the Punta della Dogana". Here is a photo of the Punta and the Salute taken one evening as we dined at Terrazza Daniele. The second most prominent feature within Dorsodouro would be the Galleria dell'Accademia (Accademia Gallery), Venice's premier art gallery. It is located at the sourthern terminus of the Accademia Bridge. This gallery, shown at left, houses magnificent pre-19th century Venetian art. Here is the ceiling of the large room as you enter. This room's entire ceiling is covered with this pattern. That was a lot of work, and we are always amazed at the craftsmanship that went into Venetian buildings. So many happy little faces! Our favorite Venetian painting at the Accademia is this masterpiece by Giovanni Bellini titled, "Sacred Conversation" (aka "Madonna and Child with Two Saints"). 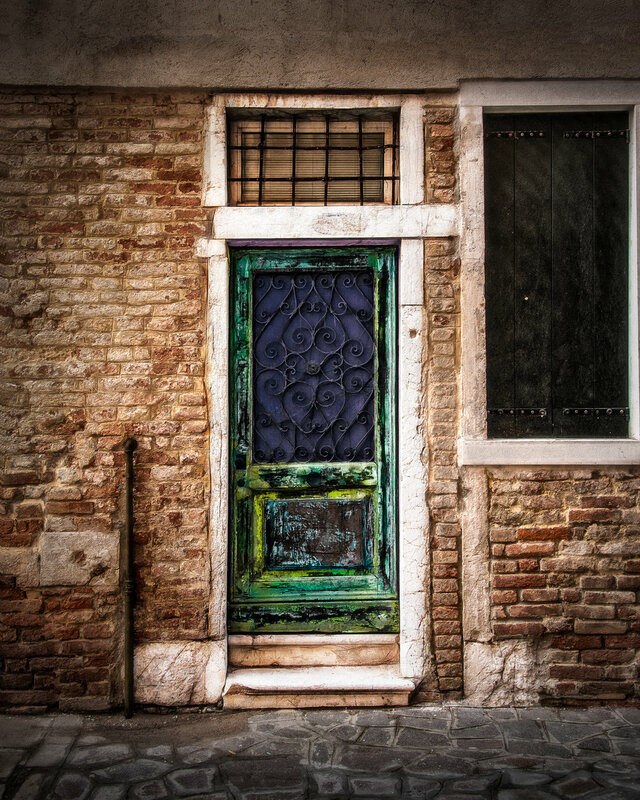 We don't visit Venice without stopping by to say, 'Hello'. Absolutely gorgeous! Another fine work found here is the San Giobbe Altarpiece, by Bellini, shown below -- just a little worse for wear. The work depicts Mary sitting on a tall marble throne, holding the Christ Child. At her feet are three musician While at the side are, in symmetrical positions, six saints. They are, on the left, Sts. Francis, John the Baptist and Job; and on the right, Sts. Dominic, Sebastian and Louis of Toulouse. On a religious-art note, Saint Sebastian is depicted often in Italian art and he is readily identified by arrows piercing his body. This magnificent palace, now the Museum of 18th century Venice, was designed by the greatest Baroque architect of the city, Baldassare Longhena for the aristocratic Bon family. Work began in 1649, but Longhena’s and the client's deaths, together with the financial problems of the Bon family, brought work to a halt, leaving the palace incomplete. In the meantime, the Giambattista Rezzonico family purchased the palace and had it completed. The Rezzonico's family fortunes peaked in 1758 when younger brother Carlo became Pope Clement VIII. After a few years, and with no heirs, the palace fell into disrepair and had several owners, including Robert Barrett Browning. 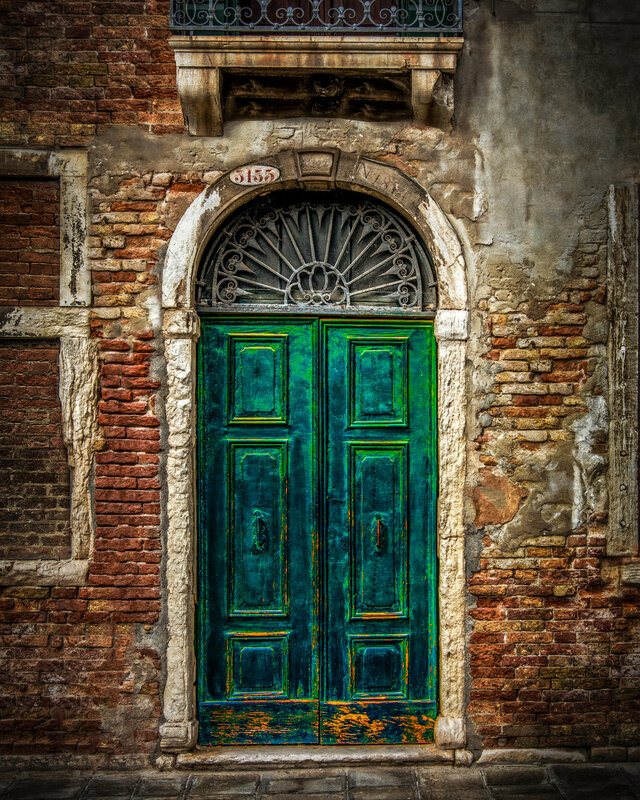 In 1935, Ca' Rezzonico was sold to the town of Venice by the owner, who was a member of the Italian Parliament. Today, Ca' Rezzonico is a must-see if one wants to understand what life was like in Venice in years gone by. Both the furnishings and the art reveal Venice's past in this beautiful building. 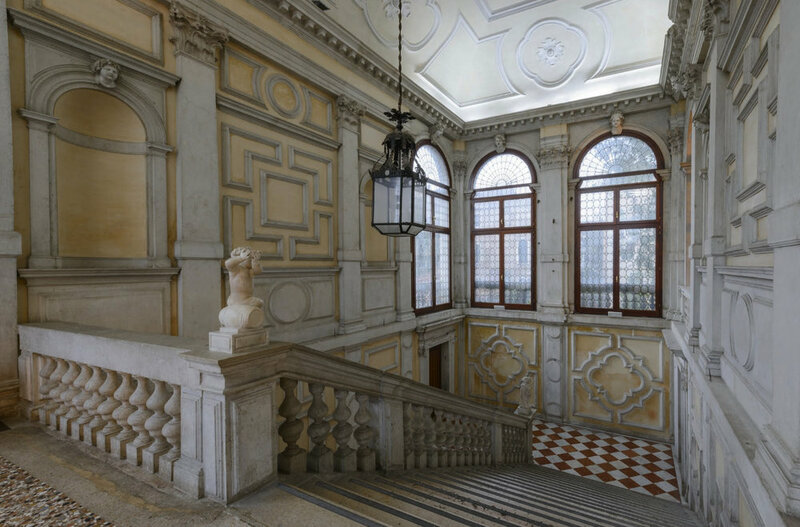 Here are a couple of photos of the interior, taken from the Ca' Rezzonico website. Below is one of the few photos that I took within the Ca' on a cold, dreary day in January, 2004. For those who have visited Venice in the warmer months, you will note the dearth of boat traffic on the canal. As a matter of fact, when we left the Ca' and awaited a vaporetto, we saw absolutely no boat traffic in either direction on the Grand Canal -- a rare site, and one of the reasons we so enjoyed our winter visit. You can see my parody of Venetian boat traffic here. 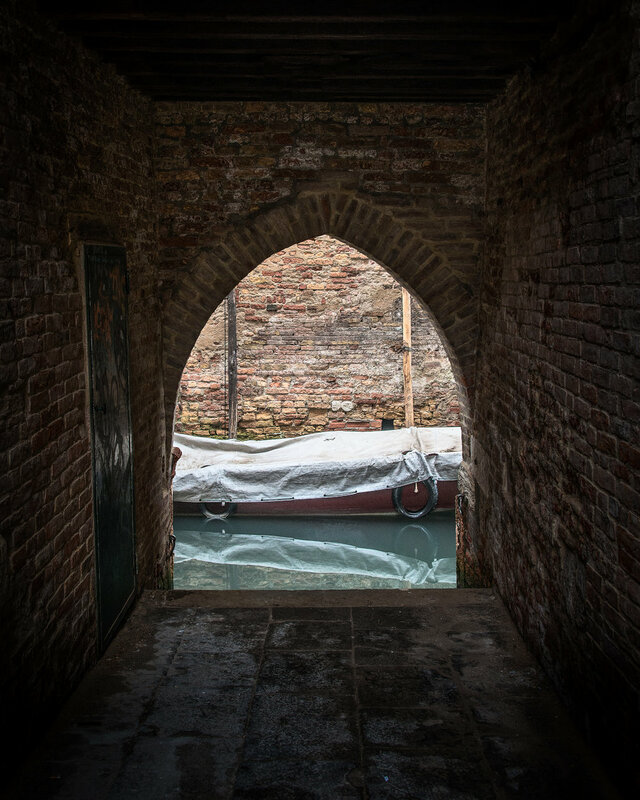 The Squero is fascinating in that it is the gondola repair facility of the Venetian lagoon. 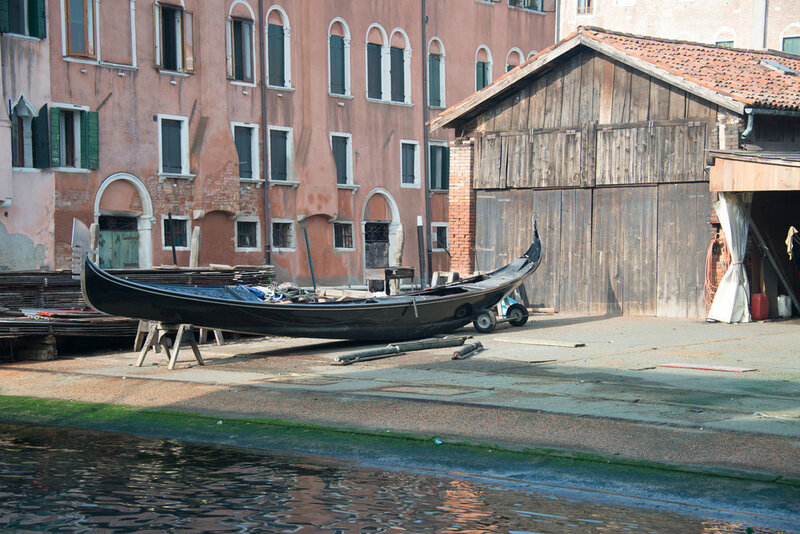 This is where the gondole are scraped and gussied up for your Romantic Gondola Ride. 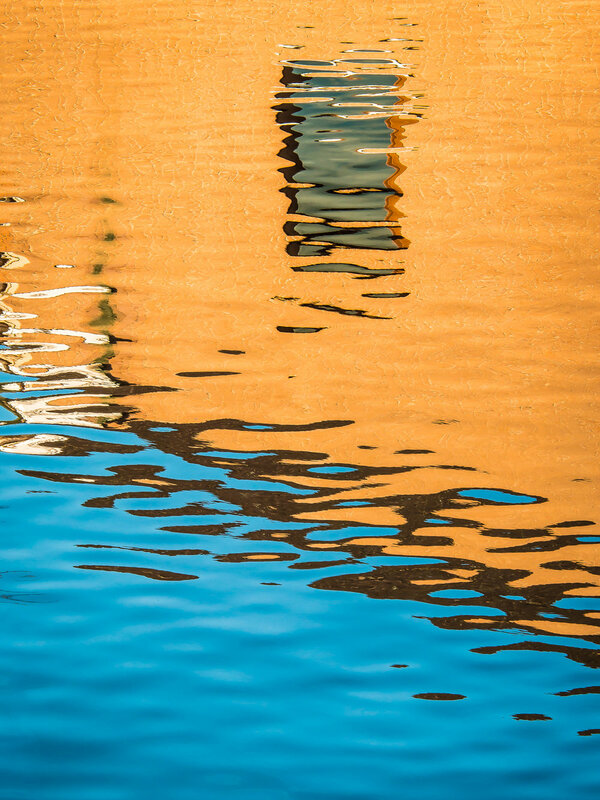 Here is a digital painting that I created from one of my photos of the Squero di San Trovaso. Hungry? Then let's take a break for lunch at Taverna San Trovaso. We've eaten here a couple of times. In the left photo below, you see the Taverna during aqua alta (high water) event. While on the right, is the Taverna in its normal state when we were there during January, 2004. I'm not sure if the restaurant was open during aqua alta, but it would seem that having 12" of water in your restaurant would cause a problem, wouldn't it? To the right is the bill for my solo meal at Taverna San Trovaso in October 12, 2012. The amounts are in Euros, or € for short. Let's break it down. But first, let's talk about calendar dates in the European format. You can see '12/10/12' on the lunch check. in Europe, the format is DD/MM/YY, while in the US we use MM/DD/YY. So the date of the check is October 12, not December 10. Got it? OK, then. Let's move on to decimal places. You can see on the check that my Coca Cola Light was '3,00'. In the US you would see 3.00. While we use a period for our decimal place indicator, most (but not all) Europeans use a comma. And to confuse things a bit more, where we use a comma to separate thousands from hundreds (eg 2,500), Europeans use a period (eg 2.500). So, 1,234.56 in the US would be written 1.234,56 in most European countries. So, what did I eat? First, we see that I had 'crudo, stracchino', which translates as raw soft cheese, which you can see here -- and in reality it includes prosciutto. I've got to say that this looks like a good bit of prosciutto for 10€, doesn't it? Next we find 'bufala', which translates to buffalo. Now, I'm not actually eating buffalo, but a salad of tomato, olive, argula and a mozzorella cheese made from buffalo milk. NOTE: this is not a buffalo milk as in bison milk, but buffalo milk as in water-buffalo milk. Got it? Next we find 'Coca Cola Light' -- in our world we call this a diet coke. I neglected to get a photo of this favorite soda during this seating, but fear not, I found one in my archives that was taken in this very Taverna San Trovaso from a previous trip. Here you see my lovely wife, Ellen, pouring this nectar of the gods...at ungodly prices -- 3€, or about 4$ at the time. Next up is '1/4 Cabernet', or 1/4 liter of house red wine. You can see the carafe in two of the photos above. That's about 8.5 ounces of wine for 3€. Reasonable by US standards...and the wine is very good. And at the exact same price as a can of diet coke, one might as well drink wine -- which is what the Italians do. The last thing we see on the bill is 'Coperto'. This is the 2€ cover, or cover charge for service. One does not typically tip in Italy (and most of Europe), but there is often a cover charge like this one. Stand at a counter to eat your meal and you have no coperto. 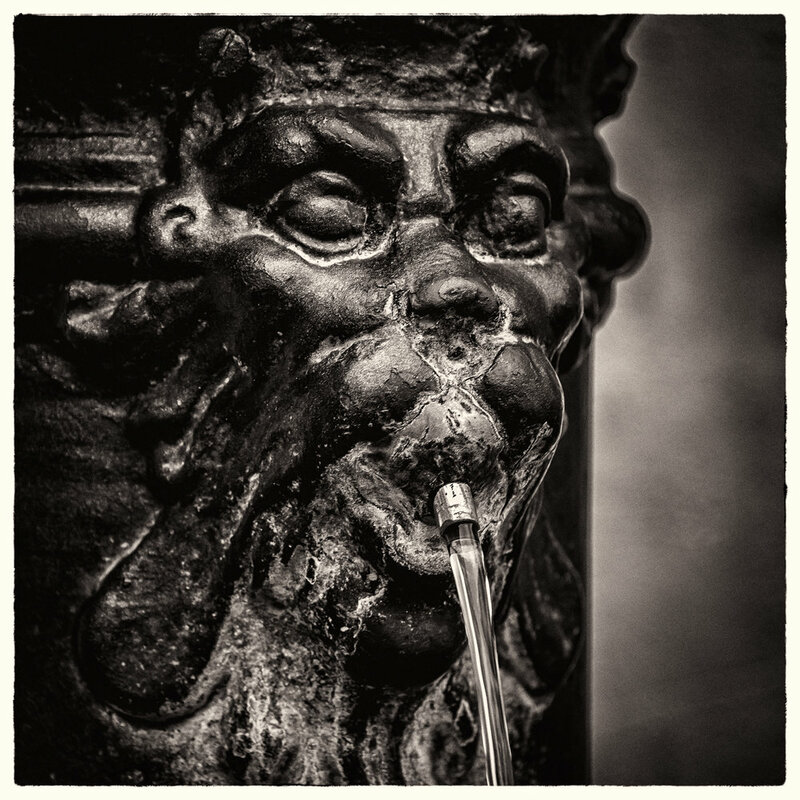 Sit in Piazza San Marco at Cafe Florian for a cup of espresso and expect a coperto of about 6€. In many restaurants, like this one, sitting to eat adds an additional 2€ -- but hey, there's no tipping. So all said, my bill came to 30€. One might think this a bit high for a light lunch, but we are in Venice, you know...where everything is brought in by boat... everything. One thing fairly unique about Taverna San Trovaso was my server, who was a woman. One does not see many female wait staff in Venice -- we've had only two in several trips. Here is my friendly waitress. OK. Lunch is over. Let's move on to other parts of Dorsodouro. I like this large campo, or field, or plazza...you get the idea. It's the heart of Dorsodouro. It is a center of trade, with numerous shops and markets, like this shop where the famous Venetian masks are being made by hand. It is a place to meet and talk with friends. It's a place for families...including their pets. And for those who attend the Università Ca' Foscari, which is in this very same Dorsodouro sestiere, it is a place for study...as you can see here as these two take notes during the lecture of Profesor Porumbel (to save you looking up a translation, 'porumbel' is Italian for 'pigeon'. And, on wash days, it is a place to hang one's laundry. 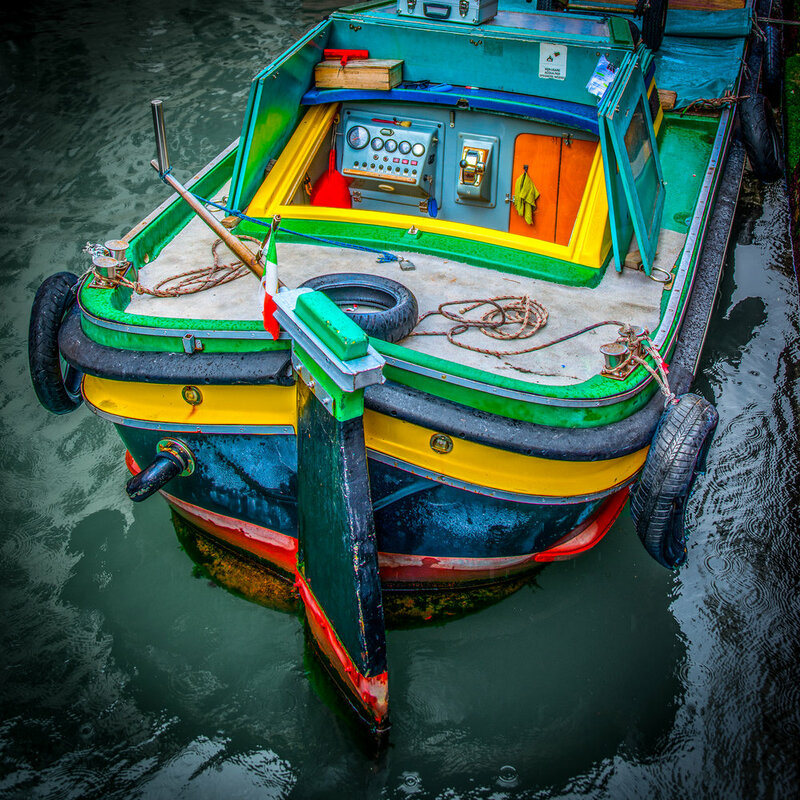 On the Rio San Barnaba canal, you can find this floating market. And that looks like none other than our own Debbie Kennedy looking at us from across the canal. This market boat seems to be semi-permanently moored here, as you can see by the mossy guy ropes. Here is some of the produce you will find at this floating market. OK, we've wandered around a good bit and it's time for dinner. I've got a good place picked out...and since you're getting a bit tired of seafood, this spot should work nicely. Most Venetian restaurants specialize in seafood...it just happens to be abundant when you live in a lagoon on the Adriatic. However, there is a restaurant where one can get more meaty dishes, and that is Ai Gondolieri. You will find more veal, lamb and beef on the menu here than most any other restaurant in Venice. It is unfortunate that when we visited Ai Gondolieri in the winter of 2004, I took very few photos with the point-and-shoot camera that I had at the time. But here is perhaps the one photo that I did have, which shows fresh flowers and an edible garnish that awaits when you are seated. I will leave you with the sights (sorry, no sounds) of the sestiere of Dorsodouro. Here I've jumped into another bridal photo shoot. And is that the same Rialto Bridge model from my San Polo article? I think it is! Well, that's the charming area of Dorsodouro...a nice, quiet place to visit when you are strolling the streets of Venice. I'll close with another photogenic, quiet canal scene from Dorsodouro. I will look for you at Campo Santa Margherita or along one of the many charming canals of Dorsodouro.